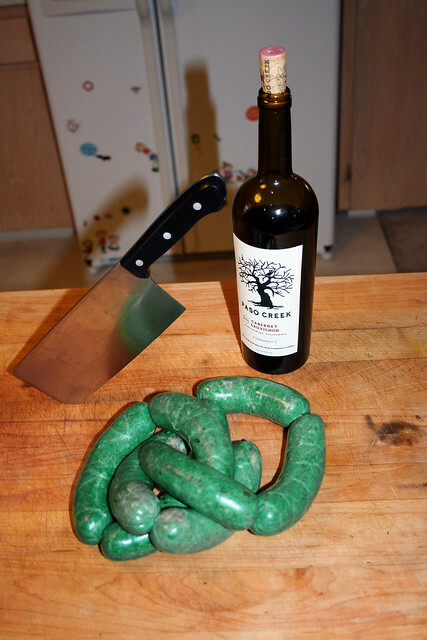 So after delivering my daughter to daycare this morning - my wife suggested with a grin that I make up a batch of brats - with a bit of green food coloring for Fiona's Dinner. 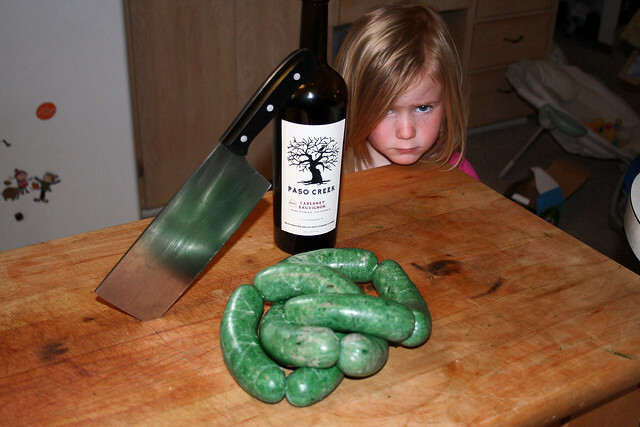 The look on my daughters face when she came into the kitchen this evening as I was stuffing the green sausages was priceless. She turned around and yelled to her mother "Mommmmyyy! I thought he was kidding!" About halfway though grilling up the finished product my daughter was looking forward to getting her chow on. The sausages based on a recipe for fresh bratwurst are truely fantastic, and the smell of them cooking had Fiona completely convinced. 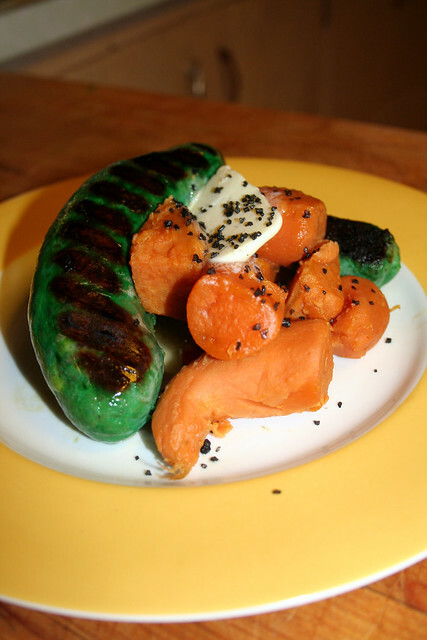 I have reproduced the recipe below with the addition of green food coloring (but I recommend the original if you decide to try it). In the end Fiona ate every bite of the sausage, and if at this point she believes in Leprechauns, at least she thinks their tasty! 10 feet/3 meters hog casings soaked in tepid water for at least 30 minutes and rinsed. Combine all ingredients except the eggs and cream and toss well to distribute the seasonings. Chill until ready to grind. Grind the mixture through a small die into a bowl set in ice(see note below). Stuff the sausage in the hog casings. Twist into 6 inch/15 centimeter links. Gently sauté, grill or roast the sausages to an internal temperature of 150 degrees F./65 degrees C.
Makes about 5 pounds/2.25 kilograms sausage; about twenty 6-inch/15 centimeter links. Notes: Keeping your ingredients cold with this recipe is very important. If the sausage "breaks" the flavor will be the same, but the texture will be undesirable.